Etan Boritzer (born 1950) is an American writer of children's literature who is best known for his book "What is God? ", first published in 1989. His best selling "What is?" illustrated children's book series on character education and difficult subjects for children currently contains 10 titles, published in 12 languages. Boritzer gained national acclaim after "What is God?" was published in 1989 although the book has caused controversy from religious fundamentalists for its universalist views. The other books in the "What is?" series include "What is Love? ", "What is Death? ", "What is Beautiful? ", "What is Funny? ", "What is Right? ", "What is Peace? ", "What is Money? ", "What is Dreaming? ", "What is a Friend?". Boritzer was first published in 1963 at the age of 13 when he wrote an essay in his English class at Wade Junior High School in the Bronx, New York on the assassination of John F. Kennedy. His essay was included in a special anthology by New York City public school children compiled and published by the New York City Department of Education. He now lives in Venice, California. Etan was also an actor from the mid eighties to mid nineties, playing roles in TV series such as Airwolf and Moonlighting. you can see his filmography here. 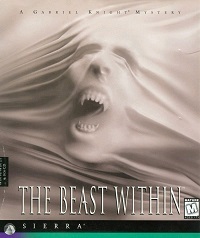 Among his roles was the hunting club receptionist, Xaver, in Gabriel Knight 2: The Beast Within of Sierra On-Line. Xaver started working at the Royal Bavarian Hunting Club in 1972, two years after Baron Von Glower established it. Considering the club is extremely exclusive, Gabriel first has to convince Xaver that he is from high German blood. Xaver knows a lot about the club members, but is very discreet. Even after Gabriel manages to gain entrance to the club, Xaver still clearly shows that he doesn't appreciate his presence.